HIS week in English Catholic History, on January 25th, 1533 the execrable Henry VIII, King of England, consummated his break with the Catholic Church by taking the extreme step of marrying his pregnant mistress Anne Boleyn, without obtaining an annulment from Rome of his marriage to Catherine of Aragon. This action, in direct defiance of the Pope, precipitated Henry’s declaration of himself as the Head of the Church of England (1534), and guaranteed Henry’s excommunication (1538) over his annulment of his marriage to Catherine for Anne. The sad truth is that in medieval Europe, annulments were frightfully easy to obtain for the rich and powerful, and were granted on dubious grounds in many cases. To cite just one example connected to English History, Eleanor of Aquitaine (1122 – 1204) had been married to Louis VII of France, but the couple had their marriage annulled on the grounds of consanguinity (they were fourth cousins). In fact, the marriage was “annulled” because Eleanor failed to produce a male heir for Louis, though she had produced two daughters. But Eleanor was the wealthiest woman in all Europe. So just eight weeks later, Eleanor married Henry II of England – her THIRD cousin, and her junior by eleven years! – and would become the mother of the celebrated Richard the Lionheart, the infamous King John and six more children by Henry. Many, many more examples of dubious annulments could be given. So, considering the moral cesspool in which most of the European nobility swam, ennabled by a corrupt church, Henry VIII might have expected the Pope to grant his request for what amounted to Catholic rubber-stamped divorce from Catherine. Yet two circumstances prevented the Pope from acquiescing. Alas, the fact that Catherine insisted she was Henry’s wife and the mental state of either spouse at the time of their marriage probably did not factor into Pope Clement VII‘s decision, as it would in an annulment today. First, Catherine was the aunt of the most powerful man in Europe, Charles V, the Holy Roman Emperor. Charles had Pope Clement in a military stranglehold. Approving the divorce was a slight against Charles’s family, and the Pope was unwilling to do this. Secondly, the marriage of Henry VIII to Catherine had already been granted through a special exception by the Pope, since Catherine had been Henry’s brother Arthur’s wife, ordinarily a canonical bar. But the would-be couple asserted that Catherine had not been able to consummate her marriage to Henry’s brother before his death, and therefore that marriage was not valid. Asking the Pope to invalidate the new marriage on the grounds Catherine had been Henry’s brother’s wife, that the Pope had already allowed at Henry’s request on the basis that she was not, was unprecedented and would further damage the Papacy’s already crumbling credibility. The Pope wouldn’t do it. The marriage to Anne Boleyn was accomplished secretly, officiated by Thomas Cranmer who had been recalled from Germany four months earlier. The place is unknown, and there are even some contradictory accounts about the date, though most sources agree the marriage happened on this day. Unfortunately for Anne, the child born eight months and two weeks later on 7 September the same year would be female, the future Queen Elizabeth I, who would seek a middle way between the religion of her radical Puritan Protestant subjects and the Catholics and Catholic sympathisers to many of whom she was an illegitimate ruler, making reconciliation with the Catholic Church a practical impossibility. Condemners of their own error, Henry VIII and Archbishop Cranmer would themselves annul the marriage to Anne on May 14th, 1536 in order for Henry to marry Jane Seymour. Anne was executed three days later by beheading for treason, adultery and witchcraft on May 17th, her body buried in an unmarked grave. Just thirteen days after on May 30th, Henry married Jane. January 20, 2019 by Dr. Foster Lerner, D.O. Posted on January 13, 2019 by Dr. Foster Lerner, D.O. HIS week in English Catholic History, we begin to celebrate the Octave of Unity from January 18th to the 25th. The Octave was created by Fr Paul of Graymoor, an Episcopalian priest and religious who brought his entire Anglican religious community corporately into union with the Catholic Church. Fr. Paul was born Lewis Wattson to the Rev Joseph Wattson and his wife, Mary on January 16th in Millington, Maryland. Rev Wattson was strongly influenced by the writings of John Henry Newman and the Oxford movement in the Anglican Church in England. He was dismissed from his Episcopalian seminary on suspicion of being a Jesuit spy. Nevertheless he went on to become the rector of a small parish in Maryland. From 1882 to 1885, Lewis studied at the Episcopalian General Theological Seminary in New York. in 1886, Lewis became an Episcopalian priest himself, serving as rector of St John’s Episcopal Church in Kingston, NY until 1895. In 1893, Fr Lewis conceived of a religious order he wished to found, inspired by the life of St Francis of Assisi, Italy. Opening his Bible at random, his eyes fell upon Romans 5:11: “And not only so, but we also joy in God, through Our Lord Jesus Christ, by whom we have now received the atonement.” Fr Lewis saw within the word “atonement” “At-one-ment”, and conceived the purpose of his order as bringing unity within the schism-troubled Church of God. From 1895 to 1898, Fr Lewis joined and led a semi-monastic Episcopalian community of unmarried clergy in Omaha, Nebraska called the Associate Mission. 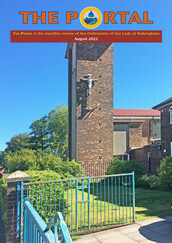 During this period Fr Lewis corresponded with Sister Lurana White, discussing the possibilities of religious orders taking monastic vows within the Anglican Communion. Sister Lurana also went to visit the Anglican Sisters of Bethany in England to learn from their model. In 1898, Fr Lewis and Mother Lurana co-founded the Episcopalian Franciscan Friars and Franciscan Sisters of the Atonement in Garrison, New York. At this time, a common monastic practice, Fr Lewis took the religious name of Paul. They took possession of the Graymoor property in 1900. Eight years later in 1908, Fr Paul created the Octave of Unity, a devotional intended to promote religious unity around the world. On October 30th, 1909, Fr Paul and the Friars were accepted corporately into the Catholic Church as a community. In many ways this corporate reception foreshadowed the creation a century later of the Patrimonially English Ordinariates of the Apostolic Constitution Anglicanorum coetibus (November 4th, 2009) which would permit the incorporation of entire parishes with their priests into the Catholic Church. Posted on January 5, 2019 by Dr. Foster Lerner, D.O. HIS week in English Catholic History, we celebrate St. Benedict Biscop, whose feast day is January 12th. St. Benedict was born in Northumbria to a noble family, and it is recorded he was a thane, or secular minister to King Oswiu for a time. Twelve years later, he repeated the journey, this time to satisfy his habit of reading good books, which were more plentiful in Rome. On his way back from Rome, however, Benedict stopped at a monastery on the island of Lérins in France. There he remained for two years, taking monastic vows. Benedict returned to Rome thereafter, and was commissioned by Pope St. Vitalian to accompany Ss Theodore and Adrian (discussed in Issue # 3 of this series) to evangelise the English people. This mission commenced in AD 669. Benedict was made the abbot of the monastery of Ss Peter and Paul at Canterbury, a role he remained in for two years. During this time, in keeping both with the intellectual Renaissance Ss Theodore and Adrian introduced in England, as well as his own proclivities, St Benedict created an excellent library for his monastery, stocked with both religious as well as the classical works of ancient literature. In 674, St. Benedict was granted by King Ecgfrith the land he needed to build a monastery in his native Northumbria, naming it St. Peter’s. He went to the continent to recruit the masons he needed to build a splendid monastery in the pre-Romanesque style. His fifth and final journey to Rome in 679 was, again, to buy books – this time for his new monastery – as well as relics of saints to surround his community with the visible remains of that “cloud of witnesses” mentioned in Hebrews, and privileges for his monastery from Pope Agatho. Returning from this journey, Benedict also brought with him Abbot John of St. Martin’s Abbey in Rome. From John, the monks learned how to perform the Roman rubrics and how to read and write Latin in Roman script. The monastery was a great success, providing the country with the tangible presence of holiness and an ascetic lifestyle for men who wished to pursue this austere mode of life in service to God. 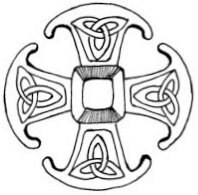 King Ecgfrith therefore asked St. Benedict to build a second monastery, which he did at Jarrow, most famous as the abode of the Venerable St. Bede himself, who provides us with so much valuable information about the English Church of this period. Bede actually knew St. Benedict Biscop himself and learned from him. It is from Bede’s pen that we receive almost all our information about his holy master. Jarrow was also the first monastery in the British Isles to be constructed in stone. We read that Benedict suffered a long illness at the end of his life that left him bed-ridden for three years until his death in 690. Today relics of St. Benedict Biscop can be found in the cities of Thorney and Glastonbury. He is honored today as a patron of the English Benedictines, and of the fine arts which he spent so much care in bringing to England to civilise it. His primary contribution was in bringing the worship and level of culture and technology of the English Church into unity (or catholicity) with that of Rome and the rest of the continent, thereby strengthening both his island home and enriching greater Christendom. Posted on December 29, 2018 by Dr. Foster Lerner, D.O. HIS week in English Catholic History, we celebrate St. Elizabeth Ann Seton, the first erstwhile Episcopalian and culturally English native-born citizen of the United States of America we have covered in this series. She is celebrated in America on January 4, the day of her death. Elizabeth was born into the cream of high New York City society. Thanks to her parents’ care for her education, she was accomplished in French, an accomplished pianist and was adept in the art of horsemanship. She was a popular socialite and when she was nineteen married a 25-year-old wealthy businessman and trader, William Magee Seton in 1794. Their marriage was witnessed by the Episcopalian Bishop of New York, Samuel Provoost. The couple was very happy together and had five children. They lived together in a fashionable residence on Wall Street, and attended the famous Trinity Episcopal Church. But eventually William’s business failed after several of his trade ships were sunk or captured. William had always been ill, suffering from the chronic disease tuberculosis, eventually succumbing to the disease in 1803. Shortly before William’s death, in a last-ditch effort to restore his health, the couple travelled to Italy, staying with William’s business associates the Fillicchis. While there, Elizabeth was exposed to Catholicism, spending hours in the nearby Catholic chapel, and the Catholic family they stayed with answered Elizabeth’s questions and furnished her with reading material defending the Catholic Church from many of the common objections to the Catholic Church. Nevertheless, when she returned to New York, Elizabeth continued to attend her Episcopalian parish. She started an academy for training young ladies to support herself and her young daughters. Two years later, however, after a period of deep struggle, she came into full communion with the Catholic Church, convinced that Jesus was present in the Sacrament of the Catholic Church in a unique way. Her academy also failed afrer parents withdrew their daughters from the new Catholic’s school. Eventually the Sisters of Charity took the necessary steps to merge with the French Daughters of Charity, as Elizabeth had desired, but which had been impossible in her lifetime due to the turbulent state of affairs in France during the early Nineteenth Century. Charles Coulomb’s informative vignette from yesteryear here. Academic Study on St Elizabeth’s spiritual direction practices. Posted on December 23, 2018 by Dr. Foster Lerner, D.O. And we kneel as our celebrant says midnight Mass. Posted on December 22, 2018 by Dr. Foster Lerner, D.O. HIS week in English Catholic History, we celebrate St. Thomas Becket on December 29, the day of his martyrdom. He was born in Pettyside, London. Due to his father’s financial setbacks, he had to leave school to support himself, and eventually started working as a clerk for Theobald, Archbishop of Canterbury. There, his talent won his master’s favor and Thomas became the Archbishop’s most trusted clerk. Posted on December 15, 2018 by Dr. Foster Lerner, D.O. HIS week in English Catholic History, we examine the O Antiphons, which in the Ordinariate are sung during Evening Prayer on December 17-24 (in the Ordinariate’s Office) or 16 -23 depending upon what Office is used and are based on the Messianic prophecies of Isaiah. O Root of Jesse, standing as a sign among the peoples; before you kings will shut their mouths, to you nations will make their prayer: come and deliver us, and delay no longer. O Key of David and scepter of the House of Israel; you open and no one can shut; you shut and no one can open: come and lead the prisoners from the prison house, those who dwell in darkness and the shadow of death. O Radiant Dawn, splendor of light eternal and sun of righteousness: come and enlighten those who dwell in darkness and the shadow of death. O Emmanuel, our king and our lawgiver, the hope of the nations and their Savior: come and save us, O Lord our God. O Virgin of virgins, how shall this be? For neither before thee was any like thee, nor shall there be after. Daughters of Jerusalem, why marvel ye at me? The thing which ye behold is a divine mystery. Apparently originating in or prior to the Sixth Century, the O antiphons appear both in the Breviarum Romanum, the Church of England’s Common Worship liturgy and now in the Divine Office of the Ordinariates of Anglicanorum coetibus.